*If you’re fien’in for another big screen appearance from Beyonce it looks like you’re about to get your wish. Previous ArticleNow, Super Bowl Is Most Watched Show Ever, But Why? Lord please say it ain’t so….I can’t stand these to even if I was high, is Disney behind this? Good for Beyonce, if those other so called actresses who can’t act are getting movie roles then so can Bey. I admit she is a light weight actress but the only way she will get better is if she keeps trying and working with an acting coach. Rihanna is getting into acting as well so, why not? YES! she is overexposed but so are Taylor Swift, Rihanna, Lady Gaga and a alot more. Furthermore, I am sure Beyonce hears the negative comments but she ignores them and keeps on pushing. i don’t blame her for that if I was a megastar and vastly successful i would not let negative comments stop me either. I don’t agree that the “practice makes perfect” syndrome works for everything. Sometimes, either you have it or you don’t. When it comes to acting, Beyonce just don’t. If Hollywood insists on repeatly remaking this movie, why not reverse the roles with an aging female star and a young up and coming male star. It would be more interesting. Also, I can appreciate the fact the B wants to act, but maybe she should develop her skills with small supporting roles. In this role she will get compared to the earlier actresses which mean that she will likely get trashed by the critics. Beyonce is to Russell Crowe as Puffy is to the entire cast of “A Raisin in The Sun”. Ok they have taken this one step to far!! I have seen both Star is born and I like the one with Barbara S. and Kris K. first of all why does Hollywood always have to add a twist. The couple in both movies were not an interracial couple! I can’t think off the top of my head who could play this role but for sure not these two. I loved the song Evergreen and like Rupaul says…Don’t fuvk it up Beyonce!!! It is only a movie remake if Crowe and Bey are cast in it, it is not that serious. There are a lot more important things going on in the world. EUR is like crack.. I just keep hittin it!! Hey Y’all!! Lawd have mercy.. this is better left alone! The main problem I have with this (aside from Beyonce’s acting ability) is the age difference. Crowe is 46 years old! I could see Colin Farrell or someone under 30! Maybe that is another twist to the story? The industry has completely sunk to a new low. 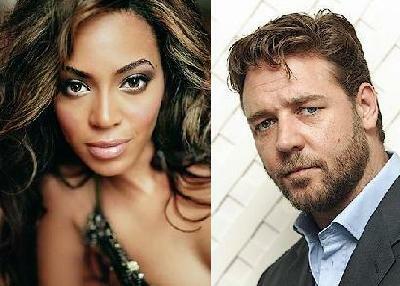 I can’t believe that Russell Crowe even signed on to this project with Beyonce attached. I can barely tolerate Beyonce as a singer. Old girl just cannot act. When will Hollyweird get it in their heads to stop offering this woman roles that should be given to sistas who can act. I certainly won’t waste my money to see this film if it ever gets made.